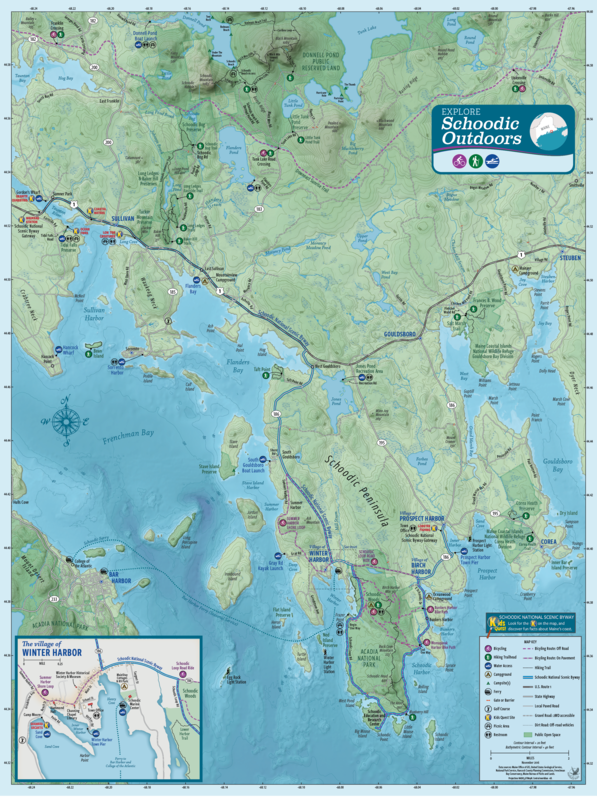 Look for the colorful “Kids Quest” signs along the Schoodic National Scenic Byway. Each of the 7 beautiful outdoor locations will engage children and their parents in the region’s history, ecology and culture. Whether kids climb aboard the small-scale lobster boat in Prospect Harbor, learn about tides at Tidal Falls in Hancock, or explore the shore in Winter Harbor, it’s sure to be fun. Kids can learn all about Maine’s big, rushing tides at this unique site owned by Frenchman Bay Conservancy. An interpretive sign illustrates how the tides work. Find out how gravity creates the tides and discover what a rare, reversing falls looks like. The Tidal Falls location is also great place for kids to run around, see wildlife, and learn about the coastal environment. Visit this mock-up railroad exhibit complete with tracks and track parts, a station shelter and a working RR crossing – push the button to make the bell ding and the lights flash. Kids can walk on the tracks and imagine trains moving alongside Taunton Bay. The exhibit has several interpretive signs about the railroad and one about Taunton Bay wildlife, too. The short walking path down the old rail bed has great views of the water. Afterward, railroad lovers can head to Ellsworth and jump on the Downeast Scenic Railroad for a ride on an old train. Hang out with the gulls at historic Gordon’s Wharf and put your hands on some old granite and quarrying tools. This Kid’s Quest exhibit features different types of granite blocks that were shaped by local quarry workers’ hands long ago. Embedded in the faces of some stones are old photographs of Schoodic area granite quarries and workers. The old granite wharf is also a great place to get close to the water and imagine how granite pavers were once loaded onto schooners here bound for Portland, Maine and other east coast cities. There’s a granite table and bench to use for lunching. Show up at the right time to witness a lobster boat or mussel hauler at the wharf unloading the day’s catch. At this Kid’s Quest site at Frenchman Bay Scenic Turnout on Route 1, there’s fun for all. Kids and their parents can use long distance telescopes to view and explore what’s out in the coastal waters. Kids can see the spectacular mountains of Acadia National Park and search the open waters and shorelines for wildlife, lobster boats, waves crashing on ledges, and sail boats cruising the bay. Kids can learn a few things about tidal mud flats at the Long Cove Rest Area. When visiting the site at low tide they can touch the mud and take the “Who Likes Mud?” quiz on the interpretive sign. There are several other interpretive signs about the site near the parking area and restroom. A quick stop here will make you want to discover other Notable Schoodic Spots along the Scenic Byway. Head to Winter Harbor and take the kids beachcombing. A short drive from the Village center on Beach Street you’ll find Sand Cove at Camp Moore. Before heading down to the water to explore the shore, read the Seaweed Secrets Kid’s Quest sign to identify and learn about what’s hiding in the washed-up Seaweed. It’s a quiet, out of the way setting with a nice place to sit and enjoy the ocean views and breezes. At the “Downeast” end of the Scenic Byway in Prospect Harbor, kids will be thrilled to board the small model lobster boat. This Kid’s Quest Site is tucked in the trees right next to the Woman’s Club Community Center and the Town Office. Located over a wooden bridge and on top of a hunk of exposed ledge, the lobster boat sits alongside two illustrated interpretive signs. One sign shows how local fishermen catch lobsters and the other sign details the parts of a lobster. In the parking area, visitors will also find a model of the Prospect Harbor Lighthouse, interpretive signs, benches and a scenic byway map.